Vegetables can be your main course, let me show you how! It is summer fest time again at Food Network and this time the hero is “Pepper“. Pepper – the first impression is it’s hot! But not always, there are hundreds of verities available in market these days. jalapeno, Thai, Anaheim, Serrano, Pablano and who knows how many. But one thing I know is that peppers are good for your health. Good source of antioxidants. In this stir fry I have used the combination of jalapeno and green bell peppers but you can go wild with how hot you like. This stir fry is super easy to make. 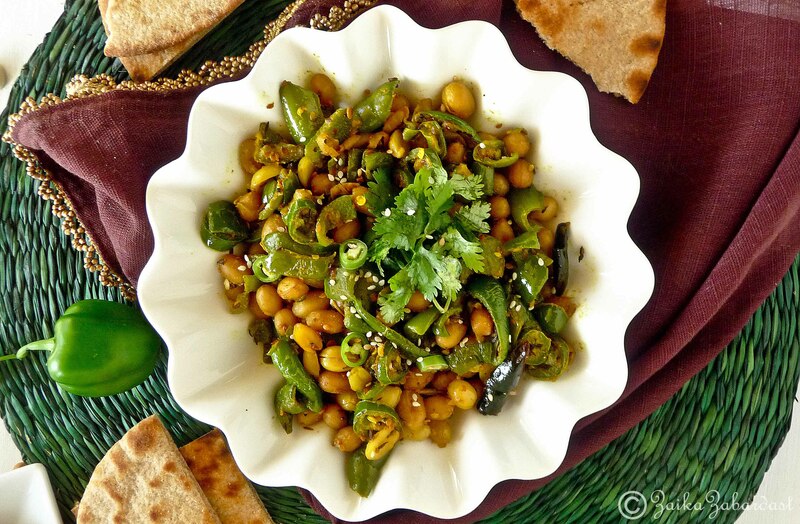 It goes really well with hot roti, rice or as a side dish or salad. I was just munching on it like snack. 🙂 This is a recipe of one of my aunt who we visited every summer when we were kids. This stir fry was always there in her menu because she knew how much we loved it. She is one loving and caring person who is always ready to give and do things for other. She always has this bright big smile that will enlighten your day any time of the day. Love her! And you know the most exciting part of our visit was that we got to eat farm fresh food every time besides her warm hospitality. And that was a real treat for us. I do not know the exact recipe but I do remember how it looked and tasted. 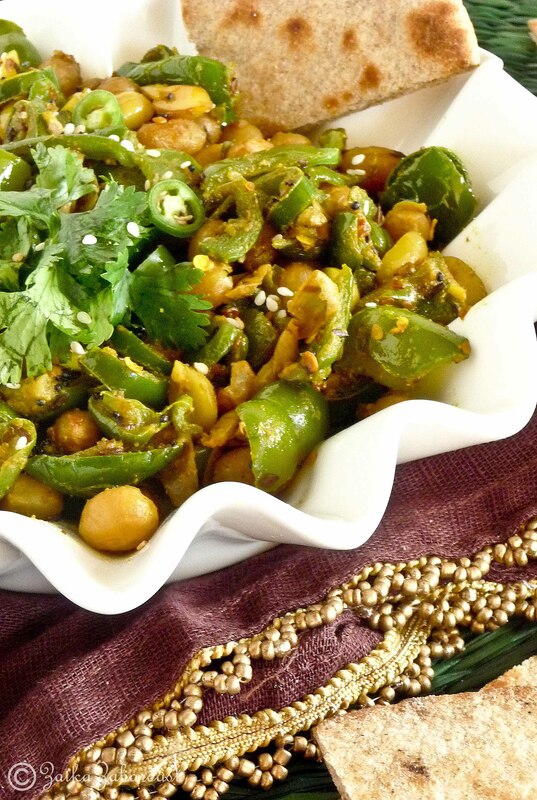 So here’s my version of quick and easy Peanut-Pepper Stir Fry! Rinse peanuts and boil it in a microwave with a pinch of salt in it for 7 minutes. While it’s boiling, chop the peppers. Be careful while handling it. Rinse hands with generous amount of salt after using it. Heat the oil in a medium wok or stir fry pan. Add cumin seeds and mustard seeds. Let it crackle. Add sesame seeds and hing along with some salt and chopped peppers. Toss or mix and let it cook on medium heat for about 5-6 minutes. 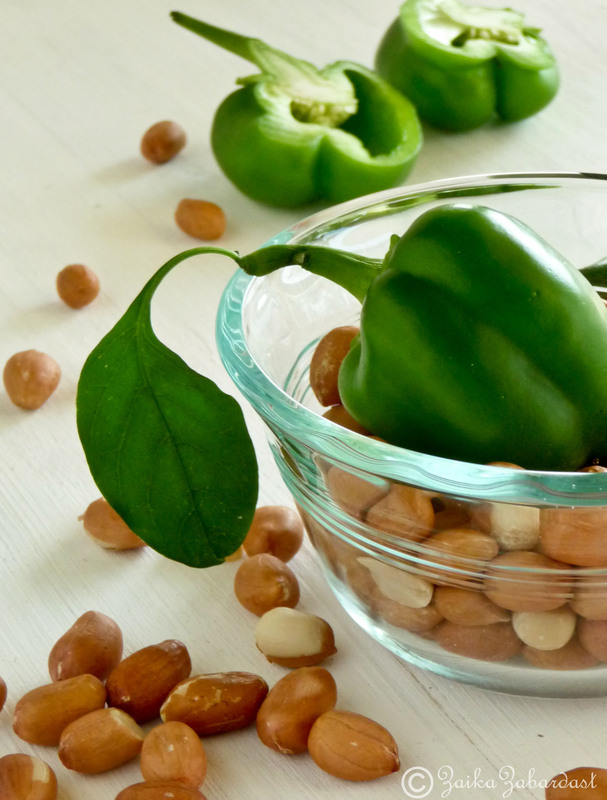 Once peppers are almost cooked add boiled (strained) peanuts. Add rest of the spices and mix well. Let it cook (covered) for another 5-7 minutes. Drizzle with some lemon juice and check the salt before serving it. Garnish with some cilantro and sesame seeds. Enjoy with hot roti or rice or just munch on! Enjoy! Also check out what my other blogger friends have made with peppers! Question: Do you like Peppers? If yes, how do you enjoy it? This sounds like a great vegetarian meal! I love cooking with peppers and growing peppers! Right now I have 2 bell pepper plants, 2 mini sweet pepper plants, 1 jalapeno, and 1 chili pepper plant! This looks wonderful and I love peppers. I also love the jalapena peppers I see in there too. I have never boiled my own peanuts but I really enjoy eating them. I can make this. This is too cute of a recipe not to pin. Wow, what a perfect recipe with so many wonderfully textural ingredients. Well done. I love the versatility of this dish.I’m pinning it to my Pinterest Side Dish Solutions Board right now but I’m honestly tempted to add it to a few more as well. And the flavors! Wow!